SanDisk Ultra USB Type-C Flash Drive lets you free up space on your next generation phone, tablet or computer that features USB Type-C ports. Who doesn't need some extra room? You're always on the move and the SanDisk Ultra USB Type-C Flash Drive is designed to come along for the ride. We combined a thin, sleek chassis with a retractable head so you can put it on a keychain or backpack. Download the SanDisk Memory Zone app from the Google Play™ store and use it to monitor available memory and efficiently manage, organize, and back up files stored on your USB Type-C tablet or smartphone . 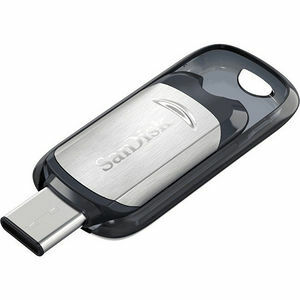 SanDisk Ultra USB Type-C Flash Drive is compatible and works instantly with PC and Mac computers running Windows Vista, Windows 7, Windows 8, Windows 10 and Mac OS X v10.6+-no drivers required. It is backed by a five year limited warranty .